Langdon Clay is a New York native who relocated to Sumner, Mississippi with his wife and fellow photographer, Maude Schuyler Clay. Clay’s New York origins give him a unique perspective into the South. His exploration of Southern values is rooted in the people of the South and the mark they leave on the natural world. In the mini-film that accompanies the Halsey Institute’s exhibition Southbound: Photographs of and about the New South, Clay explains his desire to “get as much information as possible” from a single photograph, so for as long as it may last, its viewers will receive its message. As a self-proposed “Yankee” in the American South, Clay aims to “absent [himself] from the process” and serve as a “conduit” in order to present an honest portrait of the South he observes. In Boxcar House, Clay recognizes the juxtaposition of progression and stability in the American South. 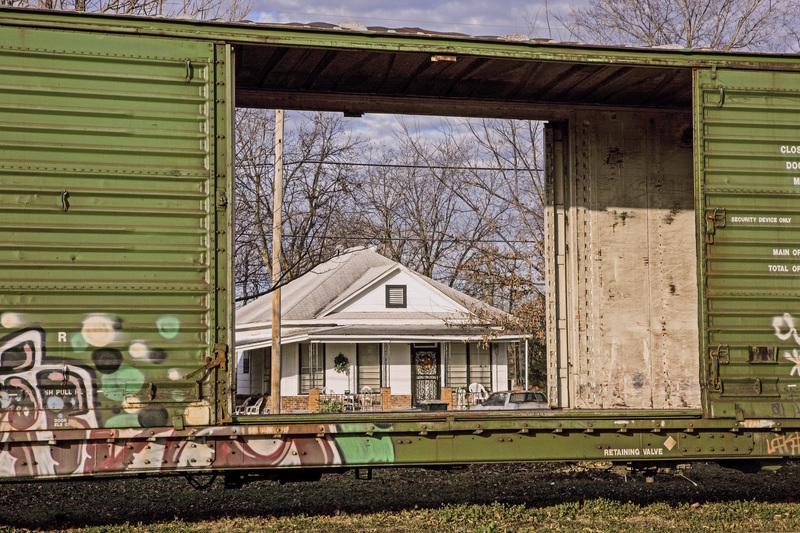 The moving train, emboldened with modern graffiti, moves past the quiet Mississippi Home, giving the small house the semblance of being frozen in time. In a world that is moving and progressing constantly, the South at times seems to stand still. Behind the advancing boxcar, the house represents the parts of the South that seems to have been left behind by modern progression. The horizontal and vertical lines of the boxcar result in a focusing effect which frames the house, like an old painting of the idealized Southern home. This romanticized Southernness contrasts with the sharp geometric features of the composition, such as the lines of the boxcar and the structure of the home. The square window on the upper level of the house also serves as a geometric center to the image, from which the rest of the house and the photograph extend. The centering of the window and the framing of the boxcar both focus the viewer’s eye to the home, furthering the idea of the Southern home as the focal point of Southern life. This photograph, and three other photographs by Clay, are on view in the exhibition Southbound: Photographs of and about the New South at the Halsey Institute of Contemporary Art. Though this image stands alone with its message, it’s story also intertwines with the other pieces in the exhibit to capture the beauty and complexity of the New American South. image credit: Langdon Clay, Boxcar House, 2009, from the series Deltascapes.